Spring in the Wildflower Garden is always enchanting. Trilliums and trout lilies are two of the troubadours of the season. Anemones, Toothworts, Hepaticas and so many others find themselves in the spotlight as well. this is the season for subtle and spontaneous beauty in the woodlands of the Garden. 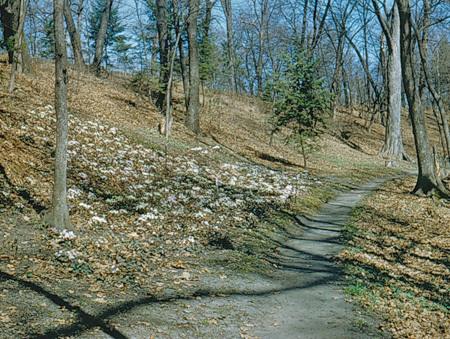 Photo: Hepatica Hill on April 16, 1955. Photo from a Kodachrome by Martha Crone. Martha planted extensively on this hill side in the late 1940s. See notes below. One of the most wonderful things about our spring ephemeral collection at the Wildflower Garden is the history contained within. Many of the groupings still found here today are remnants of what Eloise Butler planted in the early 1900s. To visit a patch of purple trillium and know that the original plants were carefully harvested for and relocated at the Garden by Eloise Butler makes the sight all that much more extraordinary. Other plant groupings found growing today in the Garden are vestiges of what was here before Eloise began her work at what was then Glenwood Park. These historical collections, some planted and some natural, are part of what makes the Garden so special still today. Unfortunately, many of the historical spring ephemeral groupings died out during a few different periods of drought and disease in the Garden's past. Most recently, a significant portion of the spring ephemeral collection at the Wildflower Garden was lost when over 165 diseased American elm trees were removed in the late 1970s. Shade from the canopy-forming elms provided refuge from the intense summer sun for the woodland wildflowers. Once the canopy was gone, the spring ephemeral species quickly perished. One such collection that vanished was a quilt-like grouping of Hepatica plants known as Hepatica Hill. It was made up of hundreds of Sharp-lobed Hepatica (Anemone acutiloba) and round-lobed Hepatica (Anemone americana) - - - the two Hepatica species native to Minnesota. (1) Hepatica Hill was a Garden treasure. The annual burst of lavender, light pink, and white from the tightly woven blanket of flowers delighted and inspired visitors as they toured the Garden. 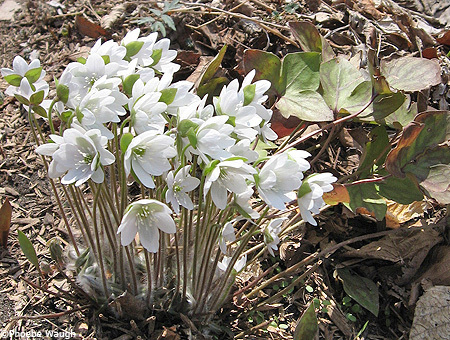 Photo above: Hepatica Hill on April 28, 2008, part of the restoration area, with bloom just starting. Photo - The Friends. Although the complete history of Hepatica Hill has not yet been uncovered, it is clear from Eloise Butler’s Garden logs that she nurtured a Hepatica plantation in the northwest corner of the Garden for many years. The specimens transplanted to this plantation came from many different locations through the Upper Midwest region. The gorgeous grouping that resulted may have been intended to serve as a holding bed, but instead turned into a living jewel of texture, form and color. We will continue to research the history of this particular planting and delve into the history of other unique plantings once found in the Wildflower Garden. We will also begin bringing these plantings back to life so that the rich history of the Garden can be appreciated in the 21st Century. 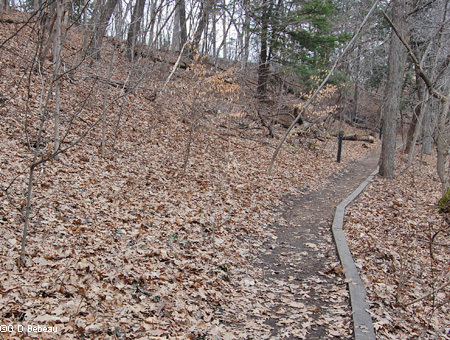 To this end, the restoration of Hepatica Hill will begin this spring. The initial planting of 600 Anemone acutiloba specimens is scheduled to occur in early -mid May (2005). 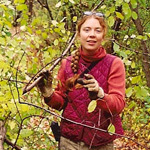 Susan Wilkins is Curator-Gardener at the Eloise Butler Wildflower Garden, a part of the Minneapolis Parks System, owned and operated by the Minneapolis Park and Recreation Board. (1) Since this article was written, botanists have reclassified these plants. In the text we have substituted the new classification from the previous scientific names of Hepatica nobilis Schreb. var. acuta (Pursh) Steyerm for the Sharp-lobed and Hepatica nobilis Schreb. var. obtusa (Pursh) Steyerm for the Round-lobed. ©2015 Friends of the Wild Flower Garden, Inc. www.friendsofeloisebutler.org Photos by G D Bebeau and Phoebe Waugh. Text additions by G D Bebeau.